Product #55663 | SKU ASU800SS-1TT-C | 0.0 (no ratings yet) Thanks for your rating! Lives up to its Ultimate name with 3D NAND Flash that provides higher storage density, efficiency, and reliability than traditional 2D NAND. The ADATA 1TB SU800 Ultimate SATA III 2.5" Internal SSD lives up to its Ultimate name with 3D NAND Flash that provides higher storage density, efficiency, and reliability than traditional 2D NAND. It features intelligent SLC caching and a DRAM cache buffer to boost read/write performance even further. Featuring LDPC ECC and technologies such as high TBW (total bytes written) and DEVSLP (Device Sleep), the Ultimate SU800 instantly upgrades notebook and desktop PCs with superior stability, durability, and power efficiency. In addition, users can download ADATA in-house developed SSD Toolbox and Migration Utility software for free to enjoy easy data management and migration. Implementing advanced 3D NAND Flash, the Ultimate SU800 features bigger storage capacities, higher efficiency, and rugged reliability with better cost-performance ratios than ever. The Ultimate SU800 reaches read/write speeds of 560MB/s and 520MB/s to accelerate PCs. Thanks to the flexibility of 3D NAND, we can offer the Ultimate SU800 in diverse capacities, ranging from 128GB to 2TB. You get more choice for different needs, whether for an OS boot drive or a mass storage drive. All Ultimate SU800 models provide high TBW (Total Bytes Written), meaning the number of times an SSD can write its entire capacity in one lifespan. The Ultimate SU800’s TBW rating outranks comparable models, indicating a longer-lasting SSD. The intelligent SLC caching algorithm allows NAND Flash memory to operate in single-level cell mode and boosts read/write performance. In addition, with the support of DRAM Cache Buffer, read/write performance can be as much as double that of solid state drives that lack a DRAM cache, or in other words that can't use system memory as an SSD buffer for high intensity tasks. Low density parity check error correcting code has been implemented on the Ultimate SU800, leading to a massive reduction in data errors and an equal increase in data integrity. It therefore protects your valuable content against corruption to a much greater extent than non-ECC SSDs or even SSDs that use basic BCH error correction. By supporting RAID Engine and Data Shaping, the Ultimate SU800 ensures data integrity and delivers extended SSD lifespan for better, longer-lasting stability and return on investment. Utilizing high quality materials and advanced technologies, the Ultimate SU800 outperforms traditional HDDs by a huge factor, with particular benefits in boot up and seek time, as well as overall much faster read/write throughput. The Ultimate SU800 supports DEVSLP (Device Sleep) technology for better energy efficiency. This results in lower electricity costs and prolonged battery life. Compared to traditional HDDs, the Ultimate SU800 consumes just 8% of the power while in idle mode, and 80% less power during regular operation. For users who often travel or go on business trips, the Ultimate SU800 is a great partner with high mobility and power-saving abilities that go easy on notebook batteries. 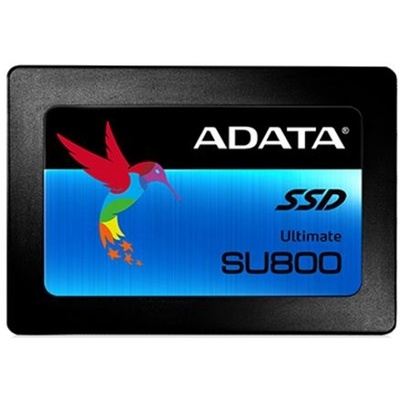 Every Ultimate SU800 purchase qualifies for free downloads of ADATA SSD Toolbox and Migration Utility. SSD Toolbox allows users to monitor and manage the Ultimate SU800, with drive status, wear level, and lifespan information. Data migration utilities are especially helpful for users making the move from HDD to SSD, as they are designed for simple and quick backup and migration of the contents of entire drives, including the operating system.